Hi there!!! Each month at There She Goes, we have what we call "There She Goes Again" week where we highlight older sets. 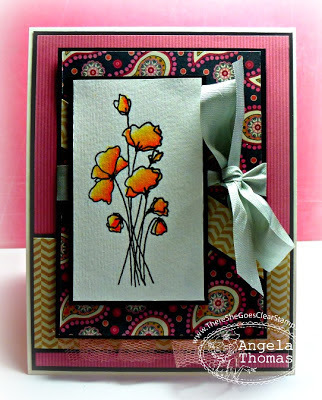 For my card today, I used the set called "Sweet Pea". This has long been one of my favorite floral sets from TSG. Love it!!! The image was stamped in Versafine Onyx Black, embossed with clear embossing powder and then watercolored with Tombow Markers. The layout for my card is the current Mojo Monday sketch challenge. Next week is sneak peek week for There She Goes so you'll be seeing some fun stuff soon!! !